Coach Freburg meets with the team during the Southern Valley game. With a whole new varsity lineup, the softball team took the season head on, improving on their skills and teamwork. The Dusters ended their challenging season 3-23. “Although our record didn’t show it, everyone got better every time we stepped on the field,” stated junior Kloey Kirwan. After graduating 11 seniors, the team was left with little depth and multiple new players on the roster. “My favorite thing about this season was how much we improved as a team throughout the entire season,” stated senior Tate Orcutt. 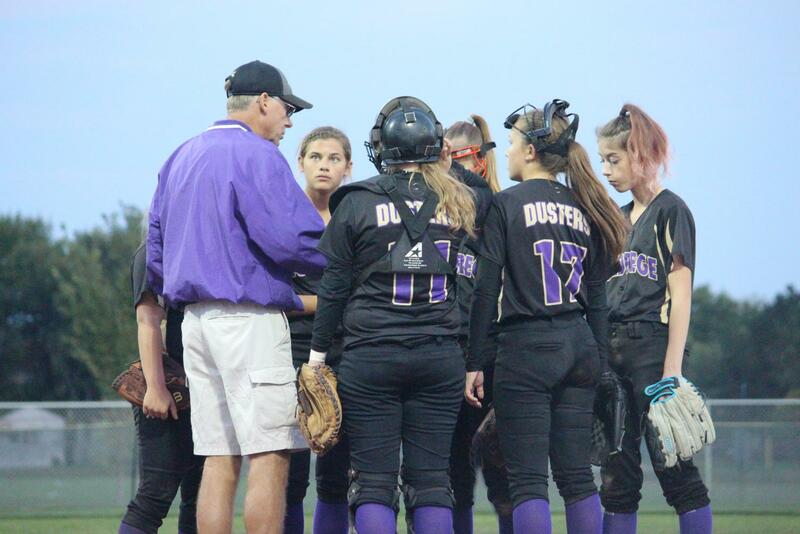 At the Central 10 Conference tournament, the Dusters played Aurora first round, losing 0-8. After that, they faced up against Schuyler and won 13-3! ”The most memorable part of conference was playing ball in freezing weather. Everyone was really bundled up, wrapped in blankets and drinking hot chocolate while watching and playing softball. I like colder weather so it doesn’t get much better than that!” exclaimed sophomore Jenessa Landin. At Districts, the Dusters ended their season with losses to Hastings and Lexington in the double elimination tournament. Leading the team in hits were senior Mercy Linden and junior Ryan Melroy, Melroy also lead in runs scored and most bases on balls along with junior Kloey Kirwan. Batting average was lead by junior Morgan Hein and senior Megan Henry. All-Conference honors were Ryan Melroy and Kloey Kirwan who received honorable mention. Melroy and Kirwan were also named Academic All-State.